So I think it would be OK to presume FBCF-5DII may NOT be ready for the prime time until BCF2 becomes available for full frame mods? We have been using the 5DII filter for years now and they work fine AS LONG AS the stock IR cut if left intact. If you only use the Baader you WILL have a Full Spectrum Mod camera...or one VERY similar to it. I dont know why Baader would make some filters IR cut, and some not...and then "advertise" all of them as IR Cut Filters...it baffles me, honestly, because the 5DII is clearly NOT an IR Cut(I am working on my IR Filter test video tonight!).. It DOES still DIRECTLY replace the stock LPF-2 filter in SIZE(and index of refraction, etc). and obviously has great AR coatings as well. So, since I have done DOZENS of 5D Mark II's alone, not to mention ANY other full frame mods, and they have ALL worked PERFECTLY with the Baader 5DII *and* LPF-1 system, I would say that the mod HAS BEEN "ready for prime time" for a long time! Just because the filter is not up to the newest Baader (BCF-1) specs/standards does NOT in ANY WAY mean that the filter is useless, or that the filter should not be used in modifications. Obviously it works, and has worked for a while now.. Using the Baader 5DII filter in a system that uses a single stock filter system..i.e. something like the Canon 5D Mark I/classic.. Same goes for the Nikon D3, which also uses a single stock filter system. if you only use the Baader 5DII you will have a Full Spectrum camera. SO...the point? You HAVE To use the CURRENT 5DII filter on cameras that have STOCK DUAL FILTER SYSTEMS! It can NOT be used on SINGLE stock filter systems as an IR Cut replacement. Wow guys let me just say it first that it's a great thread. Lot's of highly appreciated input by the pros here. I am glad I came across this discussion. I have bought a Canon 450D, it is going to arrive in the next couple of days. Of course I am planning to modify it. I really like the Idea of leaving LPF#1 on and removing LPF#2 only. However it seems that the discussion came to a conclusion that it might not be the best idea especially if you use a refractor (which I do). Now for the argument's sake let's say that I only remove LPF#2 and later on realize that it gives me images with a few stars bloating. I don't really want to take the cam apart - and/or wait who knows maybe weeks for a replacement filter from Baader or whatnot - I just simply put a 1.25" Baader UV/IR Cut filter - which I happened to own - in the light path. I know it came up during the thread but there was no definite answer to this matter. Reason why asking because on Brant's (the other Brant) test video when he stacks the Baader IR and the B+W 486 the IR was blocked completely. Hence I assume that leaving LPF#1 on + Baader IR might come up with the same result. If so I just simply remove both LPF and use the 1.25 Baader UV/IR Cut. That is basically how one would go with one of those pro imaging cameras that cost thousands of dollars. Their sensor is exposed too. That's how I image with the DBK21 as well. Having said all this I am not a pro at this. As a matter of fact I am just asking a question here trying to use common sense based on what I know (which is not too much). One of my main scope I use for AP is a Semi ED. It is not an APO but it is better than an Achro. Oh yeah and one more thing. I am only going to use this 450D for AP with telescope. AF function and focusing at infinity with lens is not relevant to me. I'll do a test with with my T1i that only has LPF#2 removed with no replacement filter when I get home this evening. 1.25" Baader IR filter and the B+W 486 filter demonstrated. Placing the additional IR filter (either the B+W or the Baader) should block most if not all of the IR from the LED. I still need to do my star bloat tests if it ever clears up around here. Don't forget the T3 (1100D). I have modded a couple of those for Greenbank Star Quest as a raffle prize. digic 4, 14bit, 12.2MP, live view, does NOT have the articulated LCD like the T3i. I'm wondering the same thing, and hopefully someone with more knowledge than me could answer? I have a Canon 1000D, unmodded, and an Orion ED80T. I'm planning to mod it soon, but I'm wondering if I should order the filter to replace LPF#2, or if I should just take out LPF#2 and order a 1.25" Baader UV/IR cut filter. Would I get the same results even though the 1.25" filter may arrive a lot sooner? Note - I also have an Orion SkyGlow filter attached to my t-adapter, not sure adding the 1.25" Baader UV/IR cut filter on top would affect the answer. I would not advise using any 1.25" accessories in the optical chain. Your vignetting will be much worse. Get a T-adapter that uses a 2" barrel and use 2" filters that screw into that. 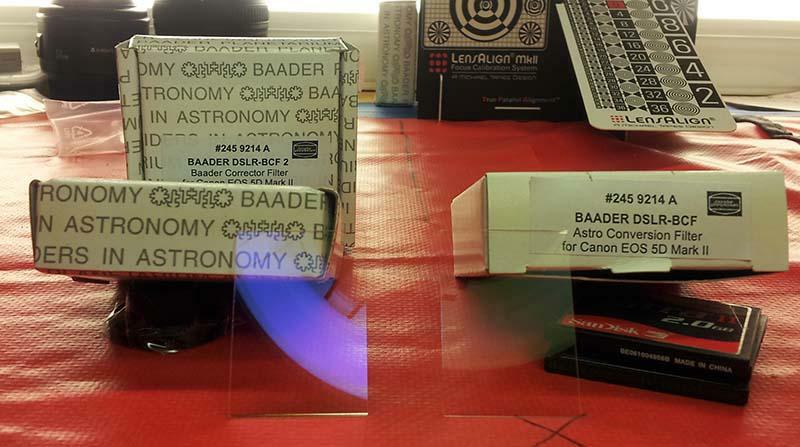 On the Baader filter, Alpine Astronomical has them in stock and you can get one in just a couple of days. The only reason is that I've been so busy with mods and other work lately that I haven't had time to re-work my web site! I need to add the T3. I am also about to release the new Astrodon full-spectrum clear modifications and filters. I have a few in hand right now for anyone who wants a FS mod for a special introductory price. These are going to be great since they are the proper thickness to exactly replicate the proper back focus when replacing both of the stock glass filters without having to re-shim or change the sensor position. Here are some images I took today with my Astrodon Full Spectrum modified Canon 40D along with an Astronomik OWB clip-in filter. The OWB filter restores the original Canon white balance allowing the modified camera to be used for fully automatic daylight imaging. Also, the new Astrodon clear filter restores perfect auto-focus after replacement of both the IR and dust cleaning filters without having to re-position the sensor like with other clear filters, so auto-focus calibration is retained. I would say that the baader BCF is a requirement for proper astrophotography through a telescope. actually I am just deleting my post, still very far off from knowing what i am talking about. Came to the conclusion that the baader was neccessary to help block excessive IR leaked from the front filter. Above mmalik asks about the new/rumored BCF-2 filter as the replacement for the FBCF-5DII filter...the Baader filter for the Canon 5D Mark II(and also the Mark III, fyi . The NEW BCF-2 filter has arrived, and IT IS FULLY/completely blocking ALL IR!!!! The NEW Baader filters are BY FAR the best option for people wanting an IR Block INside the camera. I was told by my Baader rep that they did NOT change the filters. Meaning they CLAIM the BCF-2 and FBCF-5DII are using the same coatings/processes/etc, essentially, they are the same filters. They are NOT! FBCF-5DII has ZERO IR blocking. I have several videos showing my tests to prove this that will be posted soon. I do not know why Baader decided to change up the filter's coatings to provide more/TOTAL IR blocking features, but who cares? it DOES!! I still stand by my previous statements that Baader/AstroDon/etc filters were NOT needed when LPF-1 was left intact post-mod. But this is ONLY applicable for the systems where the OLDER Baader filters will be replacing the LPF-2 stock filter; the FBCF-400D(does block MOST IR) and FBCF-5DII(does NOT block ANY IR). If those were the only options, I would recommend just keeping LPF-1 and removing LPF-2, but since the new filters provide TOTAL IR blocking, there really is no other option. period. 1.1) These filters will work for ANY digital cameras as a replacement to ALL internal stock filters! (**NOTE**, while I have modified each of these models, I have not installed the NEW filters in every model mentioned, some but not all. What I am saying is that these cameras WILL take the Baader filter without much/any work(fitting/adapting/etc). Since these WILL take the Baader filters, the NEW filters will be the ONLY filter that will need to be used to replace ALL internal filters. Meaning on some of these, with the older Baader filters, I would have to leave one of the stock filters(IR Block) intact in order to achieve the best results). Just an update...hopefully will be of some use. FBCF-5DII has ZERO IR blocking. Are you saying (old) FBCF-5DII didn't block IR at all? Are you saying (new) BCF2 completely blocks IR? Why is BCF1 still listed as FBCF-400D...? Why is BCF2 still listed as FBCF-5DII...? Can you post the pic of the (new) BCF2 packaging, if handy? Yes, not sure why Alpine still lists them as the old FBCF numbers, but the Baader sites do say BCF-1/2,etc.. I am sure Alpine will catch up sometime soon. Yes, FBCF-5DII does not block ANY IR! It is nothing more than a clear filter with AR coatings(probably some anti-scratch,etc coatings as well) made to the exact specs as the original LPF-2 on a 5D Mark II. Yes, BCF-2 blocks 100%(99.999%) IR, from what I have seen so far. miles above even the old FBCF-400D(for APS-C). Left shows that pinkish color(note, cell phone shows it kinda blueish, but in real life, it is definitely pink!) that is a tell tale sign of an IR/UV Block filter. The right shows a CLEAR filter that does not block much of ANYthing...as you can see by the reflection. it passes everything. What you do see is yellowish in color..not sure why the color is yellow, but I can tell you that next to my Edmunds Optics Clear Glass filter the FBCF-5DII looks identical. All of this is another reason why I have stated for years that a Baader filter WAS not needed for "proper AP" as they offered very little more than just using/keeping LPF-1 intact. But NOW, that is changed. Hands down, I NOW agree with Hap/Gary/etc that Baader WILL provide the BEST possible system available. by a large margin as well. 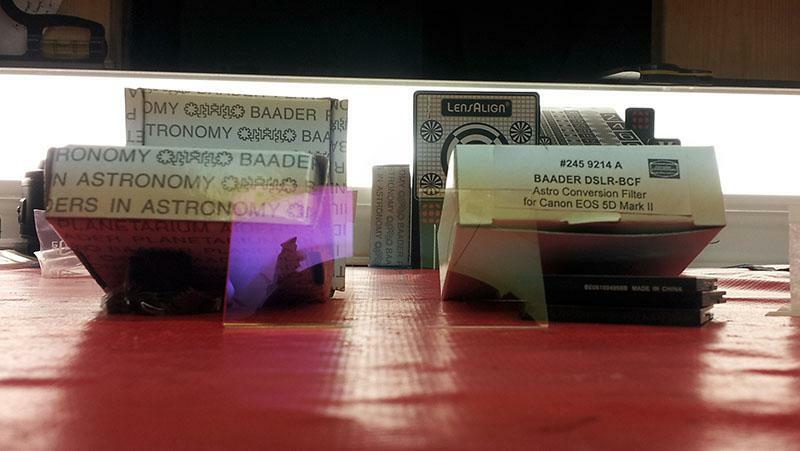 If you are getting your camera modified...ask, or even demand them/me/us use the NEW Baader filters! The Astrodon AD40D filter has always had exceedingly high levels of IR attenuation. But NOW, that is changed. Hands down, I NOW agree with Hap/Gary/etc. that Baader WILL provide the BEST possible system available. By a large margin as well. Sorry Hap, I didnt think about the AstroDon filters when saying "Baader will provide the best possible system"...That was not intentional! Just having never used/seen/tested one, it just slipped my mind! I am sure the AstroDon is of very high quality just by considering the rest of the filters Don makes that are of some of the best/highest quality filters available..
**** .....I have a "new" old version 400BCF Baader corrector filter for a 450D (#245 9213) I was just about to put in as LPF2. Guess I should can this idea and buy the Astrodon filter or a new BCF1 for 450D and take out the LPF1 as well in lieu of just replacing the LPF2 with the 400BCF. Thanks for the heads up gents. There is NOTHING "wrong" with the old filters!!!! We have been using them for YEARS. Trust me, replace LPF-2 with it, keep LPF-1 in place, and you will be perfectly happy! And will have a system just like 99% of us. The only thing about the new filters that makes them "better", especially the 5DII/Full Frame/BCF-2, is that they can be used in ANY cameras being that they have FULL IR blocking **by themselves**. No LPF-1 needed. Even though *on Canons* we will still keep LPF-1 intact regardless of which filter we use, new or old..
Good luck with the mod! Let me know if you need some help! Thanks Brent....didn't know that...mod going ahead as soon as I can build a little clean air filtered Perspex box to do the work in...a sort of poor man's clean room bench.